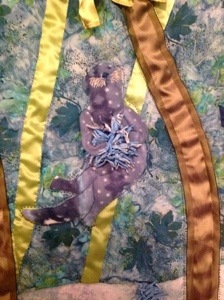 thunderchicken | This WordPress.com site is a place for me to talk about my quilting. 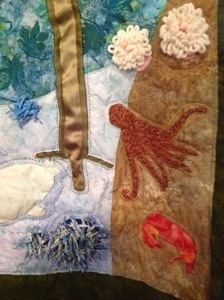 This WordPress.com site is a place for me to talk about my quilting. This year’s project was a quilt for a friend’s first grandbaby. The thought persisted. My counter thinking eventually wearing it down to a non- issue. 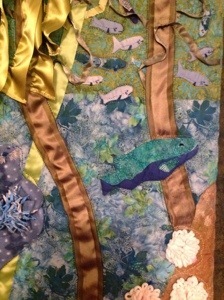 Then the thought came up again with the added suggestion that it would be a quilt made all of previously made appliqués. ‘Well, that would take care of design-and-create problems’, I countered. ‘But the quilting time on the frame will still be a lot. I just don’t think I will have the time.’ So I figured I had gotten rid of that thought. So. It wasn’t really a surprise when that school friend pulled me aside and told me her daughter was going to have a baby and asked if I would make a quilt. When I didn’t answer she said,’I know you are very busy. I wouldn’t expect it right away.’ I explained about taking classes and refining curriculum. She admits it is a lot, but then she pulls out a bag and says, ‘what I was hoping you would do is take these old appliqués from my daughter’s quilt and make them into a new one for the grandbaby.’ She offered to pay me for my time – not really a reasonable thing with this kind of thing. Hand quilting takes way too much time. It has to be a labor of love. Well. When your guides (and maybe hers) set you up, what are you supposed to do? I warned her it would not be done before school is out and might not get done befor summer was through. She claimed to be relieved that I was going to do it at all. I did work on it randomly during the school year. I had one design idea to make buttons into bubbles for the fish and seahorse so. I think that would have been very cute. But when I showed my friend my progress in late Spring she was distressed by the size (thought it was too big) and worried that her grandbaby would eat the buttons. So I stalled. Wasn’t sure what I would do now. I eventually fell into the idea of fabric paints and sea creature stamps. I stamped all over it, quilted around every big and little thing and added “ripples” where The space seemed to want something more. To me the ripples are symbolic of the ripples the granddaughter’s life will make in the universe. And the small pink starfish are symbolic of how she will make “her mark” wherever she goes in the world. Anyway, Fred helped me take some photos, so I will post it now. I have been taking classes to get another teaching certificate. This one for “Career and Technical Education”. I was recruited by the principal to teach a robotics and CAD class, so am required to get the CTE cert. I made time to put together a quilt for Cheryl Fraley’s granddaughter, born April. Still working on it at this time. Want to get it done before Fred and I take off in our recently acquired 23ft Motorhome for a trip over to Chicago, down Route 66 and back to Seattle. I did not try to make another quilt this year. But I knitted 9 pair of slippers ( plus two doll sized pair) to give as presents. I still have one more pair to do for a gift and one pair to do for myself. I have been trying to come up with an inspiration for my next quilt. If it were simple enough I could get it done before summer. Though, this summer I want to get my RV and go travel. So might not try to push a quilt through. 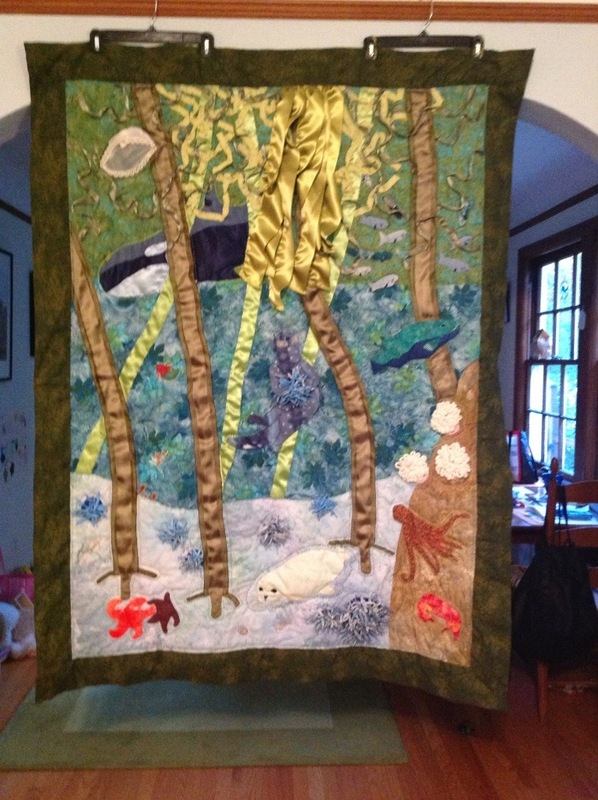 This year’s effort went into a quilt I named “wind in the Willows”after one of my son’s favorite books when he was a child. I put tremendous effort into it. I estimate over 200 total hours from September to August when I got it done just in time to enter it into the Evergreen State Fair in Monroe. 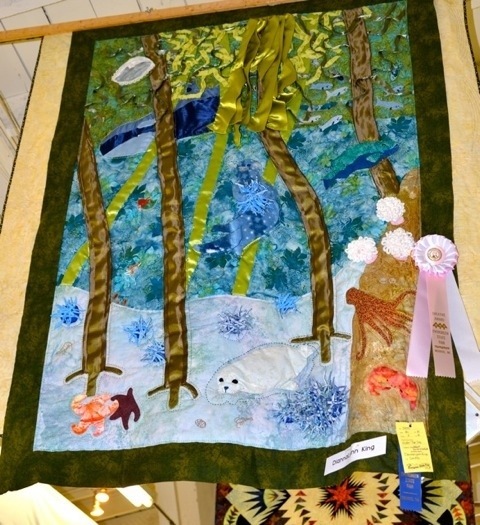 It won a blue ribbon for its category, a pink rosette ribbon for creativity, and a blue and white rosette prize for “class winner”. I am going there next Tuesday to see it and take photos on site. However, it had another person’s name on it. That’s been fixed already. But it had me laughing. 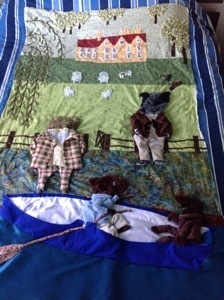 I will be taking the quilt to Brooklyn to give it to my grandson (who is dragging his heels a little bit about being born). His due date was Aug 22. I am now working on a quilt for my grandson due in August. It is my imagined scene of a picnic on the lawn of Toad Hall after The four friends have rousted the Weasels. Toad has replaced Ratty’s boat. The picnic is on the riverside lawn of Toad Hall. I will add a picture later. 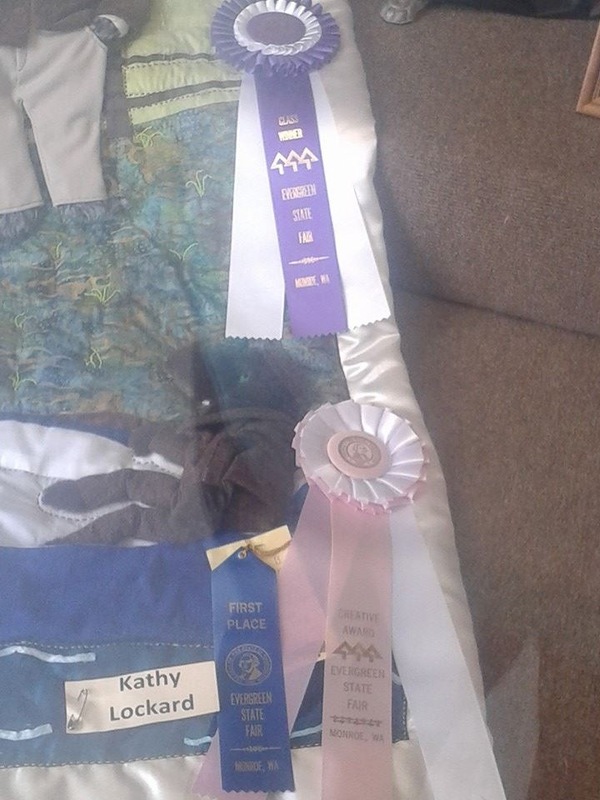 The quilt won a blue ribbon and a “creative”pink rosette. I have done what I can and I believe the quilt is ready for the fair. It is very pretty and I know the person I made it for will be happy. That’s the most important thing.